At the end of our Gala Concert in Cerritos on July 23, 2017, we all gathered on stage. Seven of our student ensembles had performed works by Haydn, Mozart, Beethoven, Tchaikovsky, Schubert, Mendelssohn and Wallin Huff. 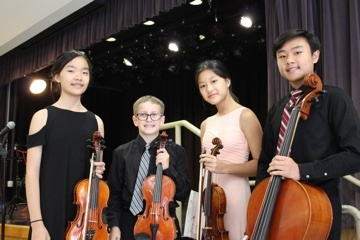 Video of Mozart “Divertimento in F” — Kaylee, Esther, Ryan and Kenneth. Video of “Time Travel through the Centuries” arr. Pech — Elisabeth, Natalie and Sophia. Video of Schubert “Death and the Maiden” Finale — Daniel, Melissa, Matthew and Jerlene. Video of Mendelssohn “Quartet in A Minor,” op. 13 — Curtis, Connie, Christina and Giulia. 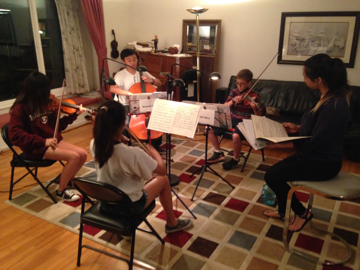 Charles Sharzer, string quartet “Downtown F” — FINALIST (recording). If you have ridden this subway line in NYC, you’ll recognize the sounds! This was recorded in July 2017 by our Faculty Quartet of Leslie Ho, Sarah Wallin Huff, Kay Pech and Judy Kang.